The role of an in-house counsel in a company is extremely vital and it is an extremely high-paid service. Often hiring an in-house counsel can exceed the financial capability of the company. Hiring an outside general counsel, on the other hand, is a more profitable option. 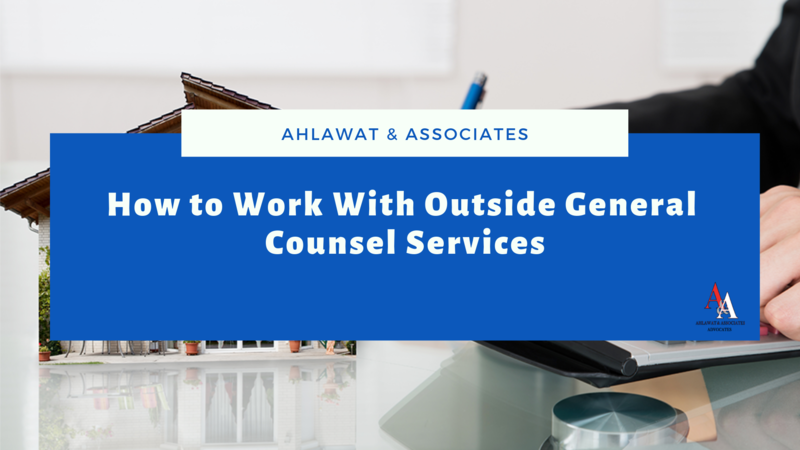 What are some of the ways in which to hire reliable outside general counsel services from which the company can benefit? The following points will highlight. When you meet the general counsel lawyer for the first time, you must have an impression that the individual is a good listener. The person should have completed a thorough research on you and your business and ready to demonstrate their expertise in the industry. In the meantime, it is crucial for you to note whether the individual is asking questions and listening to your answers carefully. Instead of touting their potential, they must express keenness to learn about your concerns. After all, you are looking for someone who is prepared to determine your offbeat circumstances and coordinates with you to find the best answers. Just ask yourself if it is the same person with whom you are ready to interact spontaneously for a long time. When it comes to working with an attorney, you may want someone who is ready to work as an independent contractor who relies on the resources of the company or set up an office within the company. when you hire India-based general counsel services from outside, the individuals working will not get the same benefit and compensation like the permanent employees. You have to search a genuine and reliable service like this. Another option is to coordinate with a law firm for this service although this can be a costly prospect as these companies tend to charge a high amount at hourly rates. The outside services are cheaper as they charge a base fee or charge low to the client companies in return of continued and assured work every month. Whether it is the quality of the legal service or the competence of the outside general counsel, it brings twin benefits to a business. However, before you hire a service provider, you must assess the role of this service provider in your company. Even the best general counsel attorney cannot help you if you are not financially good enough to pay for the service. While conducting the initial research, you have to gather information about the billing practices of the firm and find out whether the legal service provider is ready to work with alternative billing options. While you can talk to the service providers, do not miss out communicating with the past clients of the company to get assurance about the billing practices. From the clients, you will come to know about the time entries, the hourly rates and above all learn whether they have been truly satisfied with the services of the company. Whether you hire the expert from the inhouse legal services or an independent contractor, it is essential to evaluate the role of the company. The role can vary according to the nature of the company. The primary role of this individual is that of a legal advisor to the employees and the company such as marking the potential legal issues and researching them as well. Apart from this, they also provide guidance to the employees and the executives when it comes to legal compliance. The general counsel litigation acts when it comes to the legal issues within the organization which implies working closely with the service provider in relation to major business transactions and in matters of litigation. Apart from this, the individual also offers an array of legal services to the company such as drafting and reviewing the contracts, the procedures of corporate governance, and the disclosures of employment law. Overall, you have to understand the legal requirements of the company before hiring the service provider. Do you know what skills the general counsel must be blessed with when you hire the expert from the prominent law firms in India? You are already aware that the basic role of the individual is of a legal advisor. Within the context of the role, the individual must be good enough to identify the potential legal issues even before they take shape and this may come from sheer knowledge and understanding of the legal matters. There are plenty of legal issues the companies may face and the counsel must conduct appropriate research beforehand to figure them and apply the legal procedures to the situation. In addition to this, the individual must be able to explain the legal matters to the non-legal teams within the organization. To ensure that the person you hire is able and competent enough to handle the role of the legal advisor, you may conduct substantive interviews in which the details of the case is handed over to the candidate a few days before the actual interview and the strategy is asked to be presented. It is a unique approach to determine the potential of the candidate. Finding the right outside counsel is a significant decision for a business, but it may not be difficult. All that you need to do is to establish clear expectations of the business through vivid communication that may provide you valuable insights to hire the right person to serve the requirements of the business. Amy Jones has been serving as an experienced legal expert in Ahlawat & Associates-best law firms in India. She is a passionate writer and always on the lookout for opportunities for sharing her knowledge with legal community. Follow her company on various social media networks like: Twitter and LinkedIn.